The Social Studio is a Melbourne fashion label and social enterprise, focussed on helping disadvantaged and refugee community members. Their work with the young creatives in these communities has produced some incredibly unique and inspiring fashion collections, which have received acclaim in their own right. 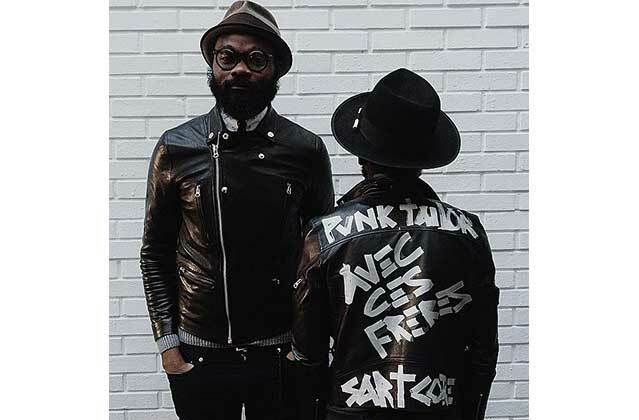 Art Comes First is made up of design duo Sam Lambert and Shaka Maidoh. The pair have worked on sartorial projects with the likes of Kanye West, Mos Def, Ozwald Boateng, and more, but they’re not your typical high fashion designers. ACF are primarily concerned with making a positive impact and social progression through their fashion collaborations which is why they jumped at the chance to work with the aspiring designers of Melbourne’s Social Studio on a collection for Melbourne Spring Fashion Week. The project has been kept under-wraps but it’s sure to be unlike any collection you might normally see at Fashion Week and it will all be revealed through a series of events during MSFW, which kicks off next week. The collection will be on show at No Vacancy Gallery from Tuesday August 25, with a live curated exhibition taking place on Sunday August 30. But if you really want to get some valuable design inspiration, ACF will be imparting knowledge at an exclusive VIP talk at No Vacancy Gallery on Saturday August 29. You’ll hear from the pair first-hand and find out what it takes to land yourself within the fashion elite. Secure your spot and purchase tickets here. 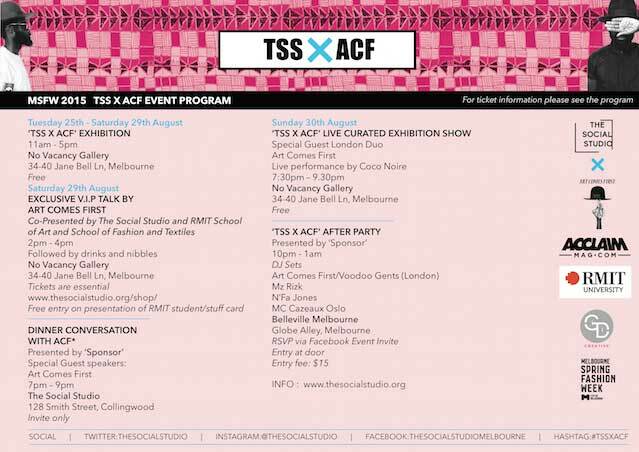 And Fashion Week wouldn’t be Fashion Week without a good party and the TSS x ACF After Party at Belleville Melbourne is not to be slept on. Featuring DJ sets from ACF themselves aka Voodoo Gents (yes, they really do it all), Mz Rizk, N’Fa Jones, and MC Cazeaux Oslo, it’s set to be the perfect way to celebrate the culmination of the festival. Tickets will be available at the door—make sure you RSVP here. So if you want to be in on the action and put your support behind local talent, check out the event and ticket info below, as well as the full TSS x ACF events program. See you there!